Nicolas Cage revisits his most iconic characters, including Ronny Cammareri in Moonstruck, H.I. 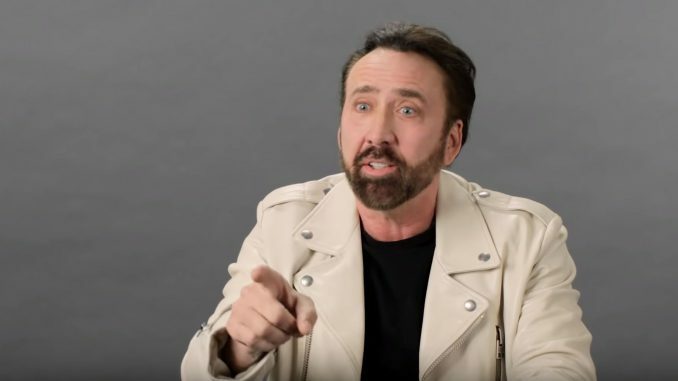 McDunnough in Raising Arizona, Ben Sanderson in Leaving Las Vegas, Cameron Poe in Con-Air, Castor Troy in Face/Off, Charlie and Donald Kaufman in Adaptation, Benjamin Franklin Gates in National Treasure, Red Miller in Mandy and more roles. MANDY is now in theaters! Mandy is a 2018 American action horror film directed by Panos Cosmatos and co-written by Cosmatos and Aaron Stewart-Ahn, which premiered at the 2018 Sundance Film Festival on January 19, 2018. The film stars Nicolas Cage and Andrea Riseborough. It is one of the last films scored by Icelandic composer Jóhann Jóhannsson. It was released on September 14, 2018 by RLJE Films.